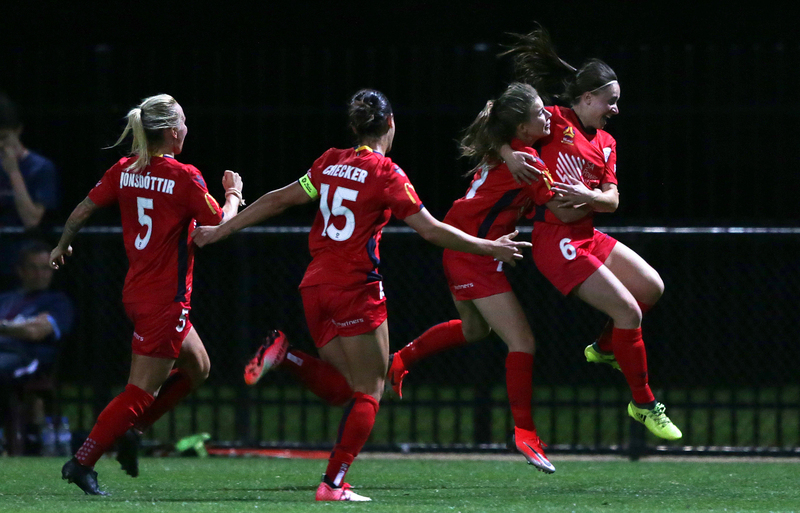 Followers of Adelaide United’s men’s and women’s teams are in for a big week. Cup success aside, there surely hasn’t been a more exciting time for Adelaide United fans since the 2015/16 season which saw the Reds win the A-League title while the W-League side had its best-ever campaign and narrowly missed the finals. And the result is that blockbuster week is coming up. It begins on Thursday night with Sam Kerr bringing her Perth Glory machine to Marden to face the unbeaten Reds. While it’s a battle between second (Glory) and third (United), the Perth side might be the team to beat this season. It’s certainly the competition’s highest scorer with 13 goals from four games. Which is because Kerr – who, let me remind you, is the best player in the world’s sixth-ranked national team – isn’t the team’s only star. Alyssa Mautz, Adelaide United’s Player of the Year last season, returns to Marden in Glory’s colours. Like Kerr, the versatile American already has four goals in 2018/19. To add further spice, Perth’s squad also includes defender Katie Naughton (also from the US) and goalkeeper Eliza Campbell – both spent the last two seasons with the Reds. Glory’s American quartet is completed by midfielder Nikki Stanton and prolific forward Rachel Hill. Throw in experienced defenders like Kim Carroll and Sarah Carroll (arriving, appropriately, just before Christmas) and you have a side that will provide the improved Reds with a stern test. The story of the game may be Perth’s attack against Adelaide’s resistance. Remarkably, the Reds have conceded just once in their four matches – and that goal was from a penalty. It’s clearly been a focus for coach Ivan Karlovic; United often struggled to keep opponents at bay last season. Much credit also belongs to the magnificent form of goalkeeper Sarah Willacy. Nevertheless, the Reds’ forwards might also have a say. Veronica Latsko, another American plying her trade in the W-League, has certainly shown her ability to find the back of the net, and Michelle Heyman is the competition’s all-time leading scorer. Heyman certainly didn’t have her best game in Saturday’s draw with Melbourne City. Despite that, she showed her match-winning quality right at its end. With United a goal down deep in stoppage time, Heyman looked set to receive a pass on the edge of the penalty area from Amber Brooks. Before that, however, she had a quick look to her side to see that substitute Georgia Campagnale was bursting forward from midfield. So Heyman produced an expert dummy and that allowed Brooks’ pass to run through to Campagnale who shot truly. Adelaide versus Perth; third versus second; Heyman and her new friends versus Kerr and her ex-Reds – Thursday night’s clash at Marden could be epic. Just two days later, Adelaide United’s storied A-League rivalry with Melbourne Victory resumes at the Stadium formerly known as Colonial, Telstra Dome and Etihad (look, I’m in a Prince kinda mood). Even at the worst of times, this fixture sets pulses racing but this could be another season in which both clubs are genuine contenders. Coincidentally, the match is being played exactly one year after a famous United win at the venue. On that occasion, the Reds led 2-1 going in to the last 10 minutes with goals from Baba Diawara and George Blackwood. But then Daniel Adlung and Ben Garuccio were sent off and United had to hang on with nine players. In April, it took a late Besart Berisha winner to sink the Reds in the first week of the 2017/18 finals. So recent history suggests that Adelaide United isn’t without hope. But Victory were in scarily good form on the weekend; there have been few better A-League performance than Saturday’s 4-0 dismantling of Western Sydney. Ola Toivonen and Keisuke Honda are outstanding recruits. Like many overseas players who come to Australia, they’re in their early 30s but both scored at this year’s World Cup for countries that were good enough to make its knockout rounds – you certainly wouldn’t call either a has been. But it might be folly for United to focus on that pair too much with Raúl Baena, Terry Antonis and Kosta Barbarouses also combining brilliantly in Victory’s forward forays. On Friday night, Adelaide United coach Marco Kurz started with the same eleven that he used in the previous round in Wellington. But there was some shuffling of positions with Ben Halloran starting at centre-forward, Ken Ilsø moving back to number ten and Craig Goodwin returning to the wing. Though the result was a narrow win over Brisbane, it was the Reds’ best attacking display of the season. The visitors did have a few chances, however, so I wonder if there’ll be a temptation – particularly for an away match against an in-form side – to return to the type of set up we saw against Perth. In that game, United had three deep midfielders. That nearly produced the defensive outcome Kurz was after as Perth didn’t open the scoring until late in the game but it hampered the Reds in attack. Irrespective of how the teams line up, mundane matches between Melbourne Victory and Adelaide United are rare. And with this being a battle between second and fourth (with both sides within striking distance of top spot) it could be a classic. Bring on Thursday and Saturday – the Cream of early season fixtures.